Rembrandt Oil Colours have an intense brilliance and depth due to the very fine grinding process used in manufacturing along with the highest possible concentration of pigments. They also have the highest degree of lightfastness and durability throughout the range. 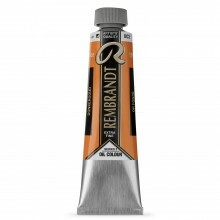 The range of Rembrandt oil paint consists of 120 colours with a balanced distribution between opaque and transparent colours. Each colour has a smooth, buttery texture and a rich intensity of pigment.